The bat’s association with night and with caves was significant to the ancient Maya, who equated nightime with death and viewed caves as the gateway to the underworld, called Xibalba (literally, “place of fright”). At nightfall the sun appears to pass through the earth to enter the underworld. In the northern Maya region, life-sustaining water is held in underground sinkholes, or cenotes, which are associated with Chak, the rain god. Thus from death comes life, a pattern seen again in the figure of the Maize God, who emerges from the underworld, through the crust of the earth, bringing forth the staple foodstuff of the Maya (as the rising sun heralds the daytime world). Death and life also come together in the act of sacrifice, and a people as obsessed with bloodletting as the Maya could hardly fail to notice the vampire bat’s habit of making an incision in the skin of its victim and lapping up its blood. This is probably why some representations of the bat depict flint knives on the snout or wings. Sometimes the bat is shown together with a severed human head, and in the Popul Vuh the hero twin Hunahpu’s head is cut off by the Cama Zotz, or “death bat.” So decapitation and sacrifice are among the qualities most strongly associated with bats by the ancient Maya. 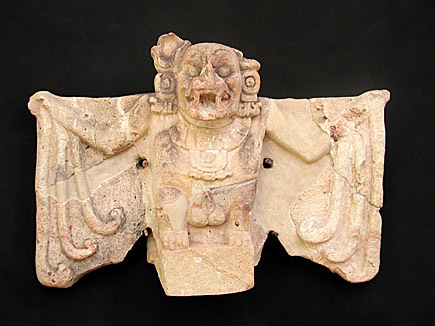 The image above is a bat carving from the sourthern Maya site of Copan. Maya cities were identified with totem animals, and Copan’s was the bat, which was often displayed on the city’s emblem glyphs. This large carving, now in the Sculpture Musem at Copan, was probably a roof ornament.